Wine should never move directly from bottle to glass. To maximize its flavor, aroma, body and beyond, invest in quality wine aerators or wine pourers. 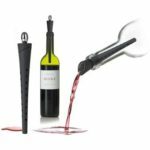 Among the many other available decanting tools, these treasures are sure to provide an unforgettable wine tasting experience. For the past few seasons, interior designers are all about rustic charm. White washed stone, barn doors and countless reclaimed furniture can be seen from coast to coast. 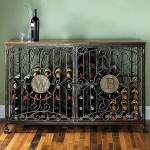 Luckily, wine lovers can embrace this elegant trend by bringing a touch of old-world style to their home with a gorgeous wine jail. Read on to find out why these sensational storage solutions are a perfect fit for your contemporary country escape. The hallmark of a great party is a nice bar selection. It’s always disappointing when you arrive at a friendly gathering to find your favorite spirit missing. And for folks who know their wine, it’s imperative that you give them a wide variety of reds and whites to choose from. Someone who drinks chardonnay won’t always enjoy pinot grigio, just as a cab lover won’t tolerate a merlot. To avoid this cocktail conundrum, you want to consider creating a tabletop setup housing a few bottles for guests to choose from. Even if you have a few bottles left over, decorating with a quality tabletop wine rack makes a lovely display all year long. How many wine bottles will a tabletop wine rack hold? Unlike your massive wine jails and wine cellar shelving, a tabletop wine bottle holder is much more modest in its capacity. Still, you’re sure to find something to accommodate a decent stock of your favorite reds and whites. For instance, a discreet wrought iron wine rack can easily hold 10 bottles, but the best part is that it hardly takes up room on your countertop or kitchen table. 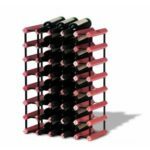 You’ll also find stackable wine racks that hold 12 bottles each in a cubby like formation. 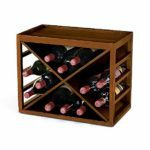 These cube-shaped wooden containers pile nicely in a corner of your kitchen counter, on a dining room hutch, or really anywhere you need to display a few bottles. 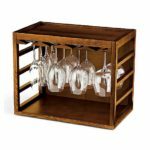 Are there any unique tabletop wine racks? If “special” is your specialty, consider a unit that’s a bit more modern and interesting in its design. A quality wine rack should serve as a stunning art installation just as much as it serves its practical purpose. 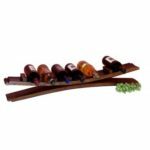 Try a trellis wine bottle display rack, which holds 7 vessels neatly in a row. Comprised of recycled wine barrel staves, these beautiful wooden racks come in a variety of finishes for your decorating pleasure. Are you a fan of the popular steampunk movement? You’ll also find a cool gears and wheels wine bottle rack that fits 6 bottles in a totally contemporary fashion. What’s a nice wine rack gift for a wine-loving friend? For a really thoughtful gift, cater to their interests and hobbies—and we’re not just talking wine! An amazing snow ski wine rack is constructed with old ski equipment and displays their wine with a touch of whimsy. 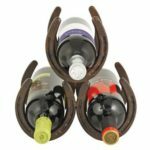 Bring a rustic touch to your birthday or holiday gesture with a 6-bottle horseshoe wine rack, which is just as charming. Nestled atop a nice coffee table, end table, or cabinet, this marvelous piece pays homage to their love for all things country. Rest assured there’s something fit for everyone’s interests. Changing leaves, cozy sweaters, and the return of everything pumpkin is enough to get anyone excited about the fall season. But for Carolina wine lovers, this time of year is incredibly special as we transition back to the mild weather that suits a leisurely trip to your local winery. As you embrace all things vino this autumn, here are the latest items and gifts trending in 2016. 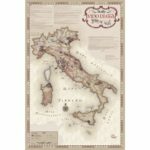 What are some of the hot items wine lovers are purchasing? Wine enthusiasts enjoy integrating fall’s fashion trends with their wine obsession. For weekend date nights or a friendly get-together with neighbors, savvy wine drinkers are investing in quality wine bottle carriers to safely tote their red and white treasures. Top selling models include stunning 2-bottle leather carrying bags in black or tan to match typical autumn clothing. 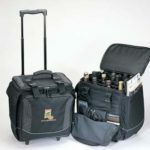 For larger events, many couples are also traveling with attractive wine luggage, which can accommodate as many as 12 bottles at a time. 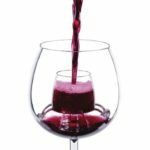 If I’m starting a wine collection, what are the wine accessory basics? For those just discovering their love for wine, there are plenty of items you should have as the basis for the hobby. To start, many wine enthusiasts put so much time, money and energy into expanding their palates. 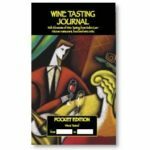 Keep track of your wine-drinking journey with a quality wine journal. These gorgeous books help you keep a record of the names of your favorite wines, vineyard locations you’ve visited, and more. You can even collect labels from your favorite varieties with wine label removers. What are the most recent home trends in the wine world? If you’re looking for items to decorate your home, many keen Carolina collectors are extending their wine décor well beyond their cellars. 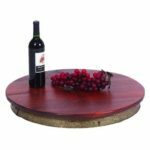 A unique wine barrel lazy susan makes a truly remarkable serving platter for your dining room or coffee table. Each piece is completely customizable, so you can add a family or individual name for a lovely gift. Another piece of artful décor is a personalized barrel head clock, which is hand painted and customizable with your choice of wood finish. It’s both functional and shabby chic, which fits well with other recent rustic furniture trends. 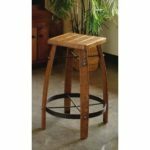 For instance, repurposed wine stave stools have made a huge splash in the wine-collecting world as of late. You see them in lots of enthusiasts’ home kitchens and bars. What are some must have gifts for a wine enthusiast? Whether they’re a total novice or a seasoned connoisseur, a wine aerator always brings a whole new dimension to the wine sipping experience. By helping the liquid breathe and letting its flavors expand, even an inexpensive filter makes for a unique must-have gift. Having dealt with wine lovers for a long time, we also recommend a stemless aerating glass. The “all-in-one” aspect tends to surprise even the most experienced oenophiles. Finally, if you’re going for the true “wow” factor, why not help your friend or family member make his or her own bottle? A genuine oak barrel wine making kit lets adventurous drinkers concoct their very own variety from home. It’s not only original and thoughtful, but also a present they’ll enjoy for many seasons to come. There’s nothing worse than a warm wine or a hot beer. So when you’re gathering friends and family for a cocktail party, barbecue or similar event, be prepared and ready with plenty of insulated beverage tubs to keep the party going. From tabletop buckets and coolers to standing totes and outdoor troughs, check out these super chill options for serving up icy cold drinks to your appreciative guests. Having a dedicated wine fridge is a true luxury if you’re a serious oenophile. It’s such a great feeling being able to pop open a crisp, cooled bottle of white or red whenever the craving comes. Still, clunky mini fridges can be unsightly in a formal dining room, living room, or gourmet kitchen. 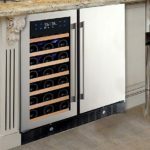 If you want to keep your wine chilled while adding a dash of panache to your elegantly designed space, check out these ideas for adding wine refrigerator furniture to your vino-loving home. How can I keep my wine cold without an unsightly mini fridge? Even the most expensive wine fridges can err on the side of “dorm room” due to their practical design. But what if we told you there’s so much more to explore? Keep the sophisticated feel of your space in tact with a gorgeous wine credenza. 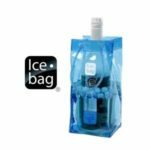 These high-end beauties integrate amazing smart features to complement their ample bottle capacity. A touchscreen wine refrigerator let’s you program to the precise degree while comfortably housing up to 28 bottles. You’ll even find a double wine cooler credenza, which helps you organize your collection while still offering pinpoint temperature control. All of these units are exceptionally beautiful, boasting handcrafted design and stunning wood finishes. How can I gain extra storage for my growing wine collection? 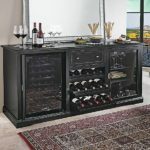 Instead of piling up your treasures on any old wine shelf or rack, integrate a wine refrigeration system in the form of an exquisite home credenza. Many of these buffet-style pieces arrive with convenient storage extras, such as drawers, movable shelving, and other nooks and crannies for a variety of items. 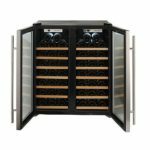 You’ll even find wine cabinets with capacity anywhere from 200 up to an astounding 610 bottles. A contemporary cherry wood wine cooling storage cabinet features beautiful cornices, curved doors, a hand-stained exterior, and other luxurious finishes. Are there any large wine cabinets for my dining room? If you’re working with an especially vast collection of bottles, you might display them proudly in the dining space for guests and family to admire. 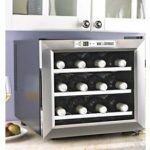 With dual-pane glass, pretty decorative door handles and timeless styling, a Sonoma wine cooler cabinet assures every bottle is safely stored and chilled to the exact degree. The piece looks lovely against a prominent wall, serving as an impressive backdrop to your dining room table. Do you get the sense that your wine collection is outgrowing your home? Even with a dedicated space, avid collectors run into this problem all the time. It’s hard enough organizing your precious bottles by year, variety, region, and more. Add the issue of space, and it’s nearly impossible to keep your hobby under control. If you’re hoping to de-clutter your home this year (starting with your wine collection), consider some of these smart storage solutions using modular wine rack systems. Units that house a ton of bottles offer ultimate versatility in any sized home. Art trends come and go so quickly in the world of interior design. That’s why it’s nice to find a piece that you not only love but that also stays relevant regardless of time and place. Luckily, we’ve found a really cool kind of functional art that pays homage to your favorite pastime—drinking wine!